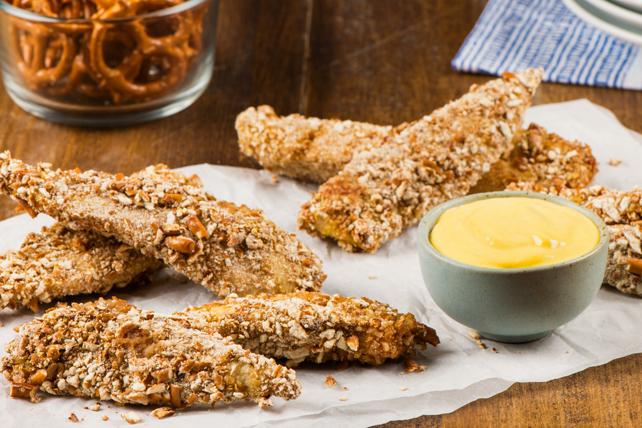 Spice up your chicken strips with jalapeño mustard. Whisk eggs and 2 Tbsp. mustard in medium bowl until blended. Add chicken; stir gently until evenly coated with egg mixture. Let stand 5 min. Place pretzel crumbs in pie plate. Dip chicken strips, 1 at a time, in crumbs, turning to evenly coat each strip. Place on parchment-covered baking sheet. Bake 10 min. on each side or until chicken is done. Meanwhile, mix Miracle Whip and remaining mustard until blended. Place pretzels in resealable plastic bag. Press bag to remove excess air, then seal bag. Crush pretzels into crumbs by rolling a rolling pin across bag. Or, use a food processor or blender to crush the pretzels.